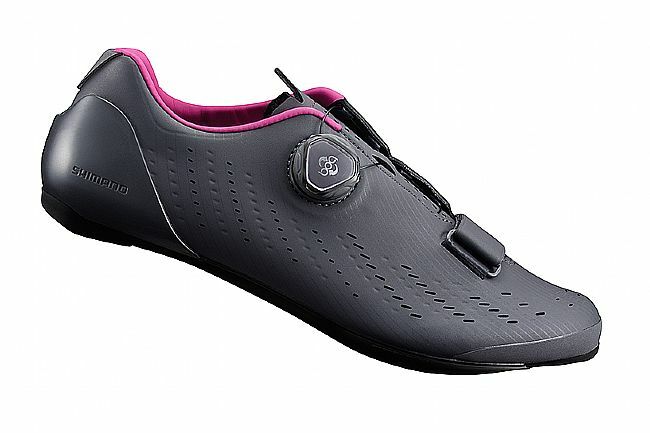 The Shimano RP7W Women's Road Shoe delivers unparalleled comfort without sacrificing efficiency or performance. Engineered to go the distance, this shoe features a high-density synthetic leather upper for long-lasting comfort, while the Boa® L6 closure system provides as little as 1mm adjustments for the optimal fit. With its perforated synthetic upper, the RP7W manages to be at once supple and durable. Designed with Shimano's Dynalast technology, the shoe is engineered to optimize power transfer and comfort while minimizing hot spots or pinches. The high-density leather features a women's specific fit for a more natural, comfortable feel on the foot. A micro-adjustable Boa® L6 dial and forefoot strap work to keep the fit tight and secure. Down below a light carbon composite outsole for optimized long ride stiffness. With a stiffness rating of 9, the RP7 pushes the power to the pavement quickly and easily. Complemented by the external heel cup, the foot is stabilized by securing the heel and foot. On the bottom, the RP7 features ample room for cleat adjustment to allow for the perfect cleat fit, no matter how demanding it may be. 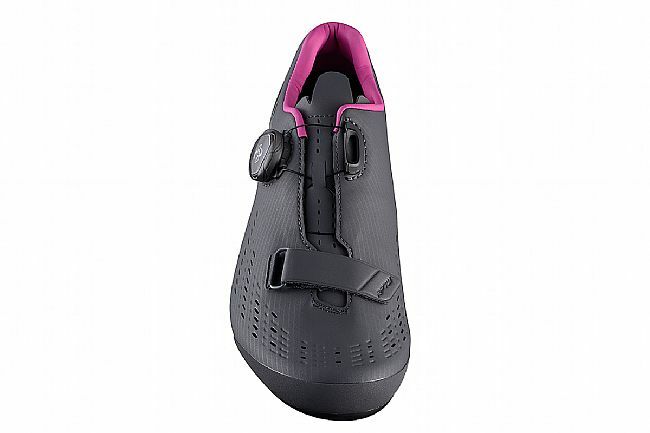 The Shimano RP7W Women's Road Shoe is compatible with 3-bolt cleats and road pedals. Perforated high-density synthetic leather upper with Boa® L6 closure system. External heel cup stabilizes and secures the heel and lower foot for optimal pedaling. Carbon fiber sole with expanded cleat adjustment for even the most demanding fit.